ANNUAL MEETING: The annual meeting of the Friends of Menotomy Rocks Park will take place on Saturday, May 1st at 12:45 p.m. at the Park. Gather at the Jason Street entrance for the short meeting. EARTH DAY: Our biennial Menotomy Rocks Park Earth Day celebration will also take place on Saturday, May 1st from1:00 through 4:00 to mark the 40th anniversary of Earth Day festivities. Family-oriented activities will include pond and wetland projects, rocketry, art, stories, games, birding (at 8 a.m.), as well as composting, energy, and atmospheric educational activities plus a bake-sale. Please wear old clothes – and bring work gloves, loppers, pruners and shovels if you have them. ECOFEST: The Friends of Menotomy Rocks Park will be participating in Arlington’s ECOFEST, which will be held at Town Hall on Sunday, May 2nd starting at 11:00 a.m.
HILLS POND: The four aerators installed in Hills Pond during the Park renovation are often out of order. At this writing, only one of the aerators is operational. The Friends will pay for the cost of a maintenance contract for the aerators, which help to oxygenate the water and retard weed and algal growth. TREES: This year, two of the Park’s older stately trees were felled by a combination of weather and age – “Old Man Willow” fell onto the ice of Hills Pond (look for its large stump on the pond periphery). An old red oak fell across the Pond path early this spring. Previously cut trees near the Shawnee Road entrance to the Park have been removed. Many thanks to Shawnee Road neighbors, who continue to work together to improve the appearance of that entrance. LETTERBOXING: The red oak tree that fell also happened to be a letter-boxing site – it had a large cavity near its base which hid the letterbox. Letterboxing is an outdoor pursuit with similarities to orienteering. A small box containing a stamp and visitors’ book is hidden, and a clue is written to lead others to its position. Clues may be as simple as a map reference, terrain cues, or may be more cryptic. When a letterbox is found, the letterboxer takes a copy of the stamp, as well as leaving their own personal print in the visitors’ book. Letterboxing began on Dartmoor in the U.K. but is now popular all over the world. There are other letterboxes in the Park; to find directions to them, check the web at www.letterboxing.org. PICTURE POSTS: Check out our local take on the science of phenology and see how nature changes in our Park by visiting: http://picturepost.unh.edu/, our Picture Post website. At each of the four posts located throughout the Park, nine pictures are taken and the panoramic shots uploaded to the web. You can view the pictures individually or as a slideshow. SHAKESPEARE IN THE PARK: This year marks the 10th anniversary of Shakespeare in the Park. The production will be Othello and will take place on Sunday, August 1st at Menotomy Rocks Park at 5:00 p.m. The play, featuring the Rebel Shakespeare Company, is sponsored by the Arlington Center for the Arts, the Friends of Robbins Farm Park and the Friends of Menotomy Rocks Park. Plans are afoot to have some workshops prior to the performance. Remaining renovation work to the pond and field pathways was finished by the contractor in June. In addition the rear field was mowed, raked, fertilized and seeded. In early July, the Arlington Tree Department cut down a number of dead and hazardous trees in the woodland area prior to the summer children’s programs held in the Park. Our gratitude is extended to the Arlington Department of Public Works for their speedy repair of a park bench which was set on fire by vandals late on a Saturday night in mid-October – and for keeping the pond lighting in good order for the winter skating season. Hill’s Pond was treated for algae and invasive pond weeds in May. Despite problems with the aerator pump, the pond remained fairly clear of weeds and algae during the summer. The four aerators were restarted in the early fall after the misbehaving pump was replaced. Work continued from spring through fall to control the spread of invasive plants and trees in the Park in our ongoing effort to preserve the beauty and diversity of the Park’s woods and pond areas. Projects included pulling garlic mustard in April and May from the gulley area before it seeded; removing buckthorn, multiflora rose, burning bush and oriental bittersweet from the pond area; removing Norway maple saplings from the Devil’s Den area and the Shawnee Road entrance and planting some new trees and shrubs in the cleared areas. The Friends wish to thank Marge Bean, Justine Block, Eliza Burden, Melissa Carr, Dana Cooperson, Barbara Costa, Ted, Anne, Matthew & Emma DeCourcey, Becky Edmondson, MaryAnna Foskett, Bill & Peggy Gardiner, Richard Goldberg, Erica Heffer, Andy James, Tom Ladenburg, Jean & Al Lokensgard, Biff Maier, Liz Reisberg, Clarissa Rowe, Greg Ruccio, Ted Siegan, Mustafa Varoglu, Dorothy Vieweg and Don Vieweg for their enthusiastic assistance. The volunteers who wielded weed wrenches & loppers during one of the rainiest weekends of a rainy summer are given special commendation! Our thanks, too, to the volunteers who assisted in making a spring Dallin School outing to the Park an opportunity to learn about nature. The SHAKESPEARE production, “Much Ado about Nothing”, was rained out but performed on schedule to an appreciative audience at the Arlington Center for the Arts indoor stage. Because of many competing claims on her time, the founder of the Friends of Menotomy Rocks Park, Clarissa Rowe, resigned from her position as president of the Friends in October. It would be hard to describe how much time, talent and devotion Clarissa has dedicated to the Park. The recently completed Park renovation might be said to be the capstone of her hard work and perseverance. Suffice it to say that we are glad she will be continuing to make more contributions in her new position as a director on the Board. Vice President Judy Weinberg has assumed the duties of president of the Board. Please let Judy know your concerns and suggestions. Please consider joining the Friends of Menotomy Rocks Park to help us keep the Park a wonderful place for all to enjoy. See our website for dues information – or send $15 (individual dues) to: FoMRP, 350 Mass. Ave. #161, Arlington, MA 02474-6713. You can also order our new t-shirts and other items at our web-store. Thanks to all who checked out our booth on Town Day, asked questions about the Park or purchased some of our parkrelated items. A number of Invasive Plant Clean-Up Days are planned for the summer and fall. July’s work sessions will concentrate on the Hill’s Pond area and tackle buckthorn, oriental bittersweet, multiflora rose, burning bush and Japanese knotweed. The second July session will be held on Saturday, July 26th from 3:00 – 5:00 pm. Please wear work gloves & old clothes and bring loppers, pruners, mattocks, shovels, if possible. Drinks & fun provided. The Friends now have four “Weed Wrenches.” They’re very impressive – come check them out. There will be work days scheduled for the Shawnee Road area of the Park in the fall. We are very grateful to volunteer Becky Edmondson for her steadfast battle this spring against a huge garlic mustard outbreak primarily in that area of the Park. If, on your walks, you can pull Japanese knotweed from the wood chip mound near the pond, please dispose of it in a barrel. Please plan on coming to the Park on Sunday, July 27th at 5:00 p.m. on the front lawn to see “Much Ado About Nothing” co-sponsored by FoMRP, the Friends of Robbins Farm and the Arlington Center for the Arts. Should be fun!!!! Hill’s Pond was treated in mid-June to control submerged curly-leaf pond weed which was widespread throughout the middle of the pond. The work was done by Aquatic Control Technologies. We hope that the four pond aerators, installed during last year’s park renovation, will soon be operative again. The aerators seem to be doing a very good job of keeping the pond clear. Watch for a repair guy in scuba gear!!!! Remaining renovation work to the pathways was finished in June. And the rear field was mowed, raked, fertilized and seeded. The Tree Department of the Arlington DPW cut down a number of dead trees in the woods in July. Please consider joining the Friends of Menotomy Rocks Park to help us keep the Park a wonderful place for al to enjoy. See our website for dues information – or send $15 (individual dues) to: FoMRP, 130 Jason Street, Arlington, MA 02476. You can also order our new t-shirts and other items at our web-store. Many thanks to Karen Dillon who protected a snapping turtle from being disturbed by passersby in one of the fields this spring while she laid eggs – by placing a chinchilla cage over her until Ms. Snapper finished her work. Thanks as well to David Bean who in three weeks of his twice-daily rounds through the park this spring collected 350 beer bottles. 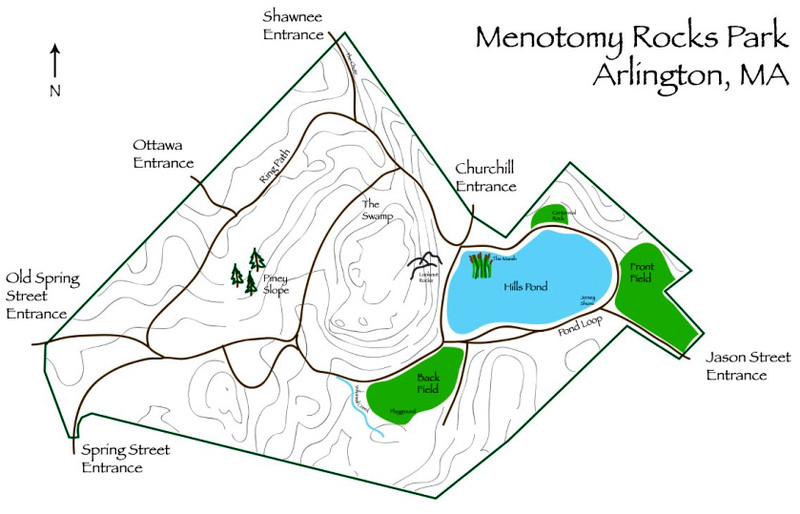 We are very grateful to all who love Menotomy Rocks Park – and who work hard to keep it the natural gem that it is. The Friends of Menotomy Rocks Park have advocated for many years for capital improvements to our treasured park, so we are looking forward with great pleasure to the beginning of construction in June. Most of the work will be concentrated on Hills Pond and the paths and fields around it. By September, we’ll have new pathways, irrigation for the renovated back field, a new aeration system for the pond, ramp access to the waterside, and repairs to masonry and fencing. It will be the same, but better! Pathways: The new Pond Loop pathways will be pitched away from the pond. A row of rocks will be laid pondside in shallow trenches. The main pathway will be 10’ wide to accommodate emergency vehicles and will run all the way along the back field up to the entrance to the woods. Secondary paths will be 6’ wide or less. French drains will be installed in areas where there are no tree roots. The farmer’s walls near the water fountain will be kept as is, and the rebuilt path leading to the playground will be 5’ wide. The 10′-wide path at the Jason Street entrance will be pitched toward the swale with a couple of dry wells installed for drainage. Large stones arranged in a pattern called rip rap will be installed along the pond pathway near the Churchill Avenue entrance to improve drainage. Hills Pond: Four new aerators should help keep down the algae and reduce the need for chemical treatments. Trees: Two damaged trees near the water fountain might have to be removed. If that happens, new trees will be planted. The Friends of Menotomy Rocks will also be planting shrubs in the fall. Beach Areas: The four beach areas will feature large boulders and stone steps down to the water. The existing granite blocks will be used & repositioned, and the Town has some blocks at the Res which could be used. The beach nearest Jason Street will be graded for wheelchair access with an S-shaped approach. Grading of the beach near Centennial Rock will be raised. Fields & Irrigation: The Back Field will be renovated—soil stripped, fresh top soil installed, and reseeded. We’ll also add an irrigation system to the back field. Jason Street fence: The DPW will remove the paint from the wrought iron fence running along Jason street, and Arlington High School students have volunteered to repaint it black. Woods: Work in the wooded area of the park will be limited to installing water bars to keep storm water from washing out the slope down from the woods. Walls: About half of the wall running along the path by the Front Field will be rebuilt. Stilling Basin: A 30’ semicircle near the pond wall will be dredged to maintain the stilling basin. Staging Area, Work Areas & Closings: The Front Field will be used for staging equipment, and silt fencing will be used around the pond while work is under way. Otherwise, we expect the Park to stay open all summer. A water bar diverts serious volumes of runoff from a trail, and all of you who use the Park know we have some serious volumes. 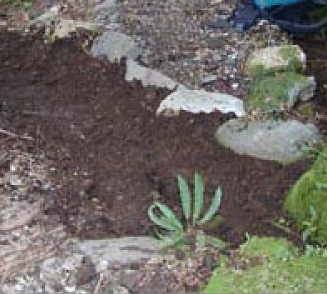 A water bar is created by digging a trench across the trail at an angle, reinforcing the downhill side with a log or rocks, and lining the new runoff path with stones to slow erosion. As we have done for the last few years, the Friends are paying for treatments to control the algae in Hills Pond. Aquatic Control Technology applies a combination of Reward (diquat) herbicide and Captain (copper) algaecide. These same treatments are used in drinking water supplies and are the best balance we can find of effectiveness and low toxicity at an affordable price. One highlight of Earth Day 2006 at the Park was the aerial photography provided by Derick and Nancy Veliz. More photos are posted on our web site. Our online picture post galleries now chronicle almost a full year in the park. Keep taking those photos. Information about how to submit your pictures, including a naming convention, can be found at http://picturepost.smgmug.com/gallery/635128. For more details, please contact John Pickle at picklejohnmr@gmail.com. Our nesting pair of Canada geese are down to one gosling from their original seven, and we’re rooting for it. At Hills Pond we had male bass guarding their nests and ramming all intruders. (“Bass torpedo” was one description we ran across.) This only goes on for a few days, and it’s worth looking out for. Park birdwatchers have spotted a family of screech owls in the woods. Seen anything interesting? You can send us an email through our web site. Fishers: Please be sure to collect all of your hooks and line when you’re finished. Dog walkers: Be responsible. Pick up after your dog and be sensitive to other park users. Picnickers: Cars are not allowed in the park. Carrying the ice chest is good exercise. Once again this winter, the Friends will hire ArborCare to prune dead branches from trees near Park pathways. The work will probably begin in January – and once again ArborCare will donate two days’ labor of the five days they will be working in the Park. As a further donation to the Park, ArborCare will treat the Park’s hemlocks to combat wooly adelgid. Our thanks, too, to Ted Siegan and David Bean for labeling more specimen trees in the Park this year. With the installation of two new benches this past fall, our memorial bench program has come to a close. New opportunities will soon be available for memorials to loved ones when the Friends initiate a MEMORIAL TREE program in 2005. Many of the Park’s older and larger trees are dying and this program will be a wonderful way to restore native trees to the Park scene. Many thanks to the volunteer crews that helped “stem” the invasion of alien plants on a number of workdays during the past year. Also, blueberry bushes were planted, weeded and maintained. Volunteer workers included: Nancy Barry, Steve Batzell, David Bean, Michelle Deziel, Charlie & MaryAnna Foskett, Richard Goldberg, Jo Hartel, Therese Hattemer, Biff Maier, Josh & Julia Martin, Don Mattheisen, Kristen Philips, John Pickle, Clarissa Rowe, Dolores Schueler, Judy Weinberg and Laura. Two WeedWrenches have been purchased for next year’s invasive plant clean-ups. DogWalkers: Many people use the Park fields and pondsides where it is very important to keep your dogs under strict control. —- Please keep them on a short lead near children and seniors. And thanks for scooping to keep our Park clean. Our thanks to the Arlington Police Department for replacing the Pedestrian sign at the Jason Street crosswalk. It has made crossing Jason Street much safer and has had the additional benefit of slowing traffic. Two wonderful publications about our Park are now available: a new publication by journalist and author Pat Thomas, The Benches of Menotomy Rocks Park, ($12) and a new edition of Menotomy Rocks Park: A Centennial History ($10) by Don Mattheisen. For a copy or copies, please send your check made out to Friends of Menotomy Rocks Park to: Friends of Menotomy Rocks Park, 54 Brantwood Road, Arlington 02476. The severe late September windstorm felled an old oak near the Playground, resulting in major damage to the structure. The Town and the Friends will be working together to have the necessary repairs made – hopefully before winter sets in. This past spring, the Arlington Parks and Recreation Commission hired Landscape Architect Andrew Leonard to project cost estimates for the site improvements requested by the Friends of Menotomy Rocks Park, based on a survey of our members. Mr. Leonard’s estimates indicate that the needed improvements will cost over $500,000 – considerably more than the $120,000 approved by last spring’s Town Meeting. The Friends will continue to work with the Town and grant-dispensing organizations to help raise the money needed to improve the Park paths and fields. Once again this year, in mid-November, trash cans will be removed from the field and pond areas of the park to lessen damage to paths and grassy areas caused by trucks. Winter trash barrel locations are at the entrances to the Park on Jason St., Churchill Ave., Ottawa/High Haith and Spring St. The Town DPW will return the additional trash barrels in early April. Heartfelt thanks to the Park volunteers who rolled up their sleeves on our Sunday, October 16th workday  to Melissa Carr, Carmenza & Clif Fonstad and Clarissa Rowe who installed the “menotomy rock and cobblestone” edging along the Jason Street fence perennial garden to Mary Cummings, David Bean & Ellen Reed for repairing the Jason St. bulletin board  and to Jane Auger, David Bean, Dilys Burke, Colin Campbell, Madeleine Drucker, Paul Fontaine, MaryAnna Foskett, Jane Howard, Carol Kalauskas, Barbara Kleeman and Elizabeth Rehfeld who did battle with Japanese Knotweed, Common Buckthorn, Norway Maple saplings, Japanese Barberry, Burning Bush and Oriental Bittersweet – all invasive woodland thugs on the USDA’s most un-wanted list. During the summer, volunteers Melissa Carr, MaryAnna Foskett and Ted Siegan worked to cut back invasive purple loosestrife in the pond stilling basin. Our thanks to the Good Samaritan who called the Animal Rescue League on August 20th to come to the aid of a mallard who had gotten entangled in fishing line and had a fishhook through her wing. Two competent ARL staffers with two rescue vehicles, a kayak, a net, and lots of TLC soon had the unfortunate duck on her way to treatment at an ARL hospital. You may have noticed the two “picture posts” installed last spring – one at the Jason St. beach area and one by the South Field fence. Pictures taken at these posts will provide visual documentation of changes in the Park over seasons and years. You can help with this scientific effort by positioning your digital camera as instructed on the post signs and uploading the resulting photos to our website at http://picturepost.smugmug.com/ . You may also view similar documentation taken by our partner park in this venture, Fresh Pond Reservation (FPR). Basic information about how to submit the pictures, including a naming convention, can be found at http://picturepost.smgmug.com/gallery/635128. For more information, please contact John Pickle at jpickle@mos.org. PARK VOLUNTEER DAY: A Park clean-up and improvement day will be held on Saturday, May 22nd from 9:00 a.m. to 12:00 noon . Rain date is Sunday, May 23rd, 2:00 – 5:00 p.m. Some tasks: invasive plant removal (including digging out roots), replanting on removal sites; playground & memorial bench maintenance, trash clean-up. Your help is greatly appreciated! FRIENDS’ ANNUAL MEETING: The annual meeting of the Friends of Menotomy Rocks Park will take place on Saturday May 22nd in the Park at 5:00 p.m. Agenda: brief discussion of prior year accomplishments; plans for the future; vote on board nominations. Bring a picnic at 4:00 p.m. — check out the photos and come to the meeting. SHAKESPEARE IN THE PARK: This year the spotlight is on Two Gentlemen of Verona, which will be presented on Sunday, July 11th at 6:00 p.m. Sponsors are The Arlington Center for the Arts (ACA), the Friends of Menotomy Rocks Park and the Friends of Robbins Farm. There will be a workshop with the actors for children over eight years of age at the ACA in the afternoon prior to the play. The recent Friends of Menotomy Rocks membership survey about capital improvements indicated that over half of the respondents want pathway repair to be our top priority when funds are available. Other vote-getters were field repair, tree pruning and tree planting. ArborCare Tree Service completed five days of much-needed tree pruning and dead tree removal work around Hills Pond and the two fields in early April. The Friends thank ArborCare’s Mark Bezreh for generously contributing two days’ of the tree work and for re-spraying the Park’s hemlocks to control wooly adelgid as a community service. Aquatic Control Technologies will once again be treating Hill’s Pond for invasive plants and algae this May. Look for orange informational signs around the pond. DogWalkers: Many more people use the Park fields and pondsides once the weather warms up in the Spring — Please keep your dogs on a shorter lead near children and seniors. Thanks, too, for scooping!